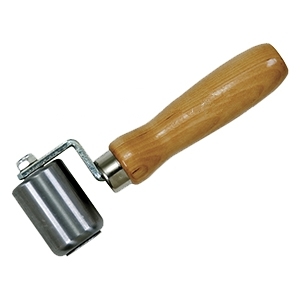 PRODUCT: Everhard Steel Seam Roller, 2 inch wide x 1-1/2 inch diameter polished steel roller, one radiused edge, single fork, ball-bearing professional grade, 5 inch hardwood handle. Price/Each. Single-side offset roller attachment for close to wall detail work. This roller makes work easy and faster for the professional. Also see our Silicone Seam Rollers.